The news came a lot sooner than I had expected it to but it was no real surprise when SVT revealed that the 2016 Eurovision Song Contest would be held in Stockholm. Stockholm has everything needed to be a good host city: excellent infrastructure, all the hotel rooms you need, all facilities an event of this magnitude requires. Stockholm was the obvious choice. I think SVT already knew they wanted Stockholm the moment that Måns Zelmerlöw won in Vienna, and opened up a bidding process mainly for the sake of transparency and to see if anyone could come up with a bid as good as Stockholm's. 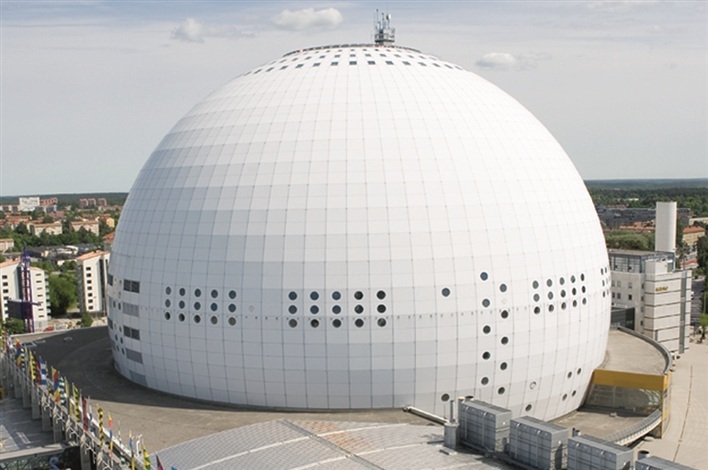 What surprised me a bit was the choice of arena as the Swedes opt to go back to the good old Globe arena, opened in 1989 and venue for the groundbreaking 2000 ESC. While still being a fairly futuristic and pretty cool building, there are newer and more sophisticated arenas in the Stockholm area. We sort of knew SVT wasn't too keen on Friends arena after a few years of hosting Melodifestivalen there, but my bet would have been for the even newer Tele2 Arena to get the honour. The Globe is an excellent, friendly arena that feels cosy and welcoming and that allows good atmosphere as well as good opportunities for the director. It's just as big as it needs to be and hopefully the 2016 ESC will look fantastic on-screen. A very good start to the 2016 season, I'd say.